It goes without saying that territorial disputes have always been a major cause of aggravation in bilateral relations between nations, but in the last couple decades this topic has become even more acute. As of today, more than 50 international players have unsettled territorial disputes with their neighbors on their hands. However, even if the problems states are facing may be similar, the reasons behind them can be extremely diverse. Among those reasons is the absence of a clear-cut border line that governments may be tempted to exploit to make territorial claims in areas rich in natural resources or those that can be of high strategic importance. To make matters worse, it’s not unheard of when governments would escalate territorial disputes with their neighbors in order to shift public attention from the complicated internal political situation they may be facing at home to create an image of an “external enemy”, thus implying that an opposition to this alleged threat is far more important that addressing issues at hand. However, what is particularly disturbing is that those escalations are more often than not being exploited by Washington in a bid to succeed in pursuing its policy of choice, that is divide and conquer. In recent years, this has become particularly visible across the Southeast Asia, where the US is trying to get its principal strategic opponents – Russia and China – to get stuck in a series of territorial disputes with a number of local players. And there’s no doubt that those disputes can get particularly nasty rather quick, in a situation when the United States is prepared to mount a major assault against those states that were unlucky enough to dispute borderlines with Washington’s allies, taking advantage of a wide network of military bases it has installed all across the globe. It’s particularly disturbing that Washington has been heating up the conflicts over the so-called disputed islands between Beijing and a number of its allies in the South China Sea, along with the dispute between Moscow and Tokyo over the Kuril Islands. The latter dispute is of particular interest for the US as its aggravation may result in Washington securing its strategic objective of gaining direct access to the Russian national borders in the East. To obtain a solid grasp of this international issue, one has to learn that at the final stage of the Second World War, during the Yalta Conference in February 1945, Moscow listed the return of Sakhalin and the Kuril Islands among the conditions for it to join the campaign against Japan that Washington had been fighting throughout the war. The pledge to fulfill this demand can be found in the Yalta Agreement singed by the USSR, the US and the UK on February 11, 1945. Once Japan was completely defeated, it signed the act of unconditional surrender on September 2, 1945, thus accepting the terms of the Potsdam Declaration. On January 29, 1946, the commander-in-chief of the Allied forces in Japan, American General Douglas MacArthur, notified Tokyo that the Kuril Islands were to be handed over to the USSR. Finally, a decree issued in Moscow on February 2, 1946, made those islands Soviet territory. According to the San Francisco Peace Treaty of 1951, concluded between the allied countries and Japan, Tokyo renounced its claim of the Kuril Islands and Sakhalin. In 1956, the USSR and Japan concluded a joint declaration formally proclaiming an end to the war between them, thus restoring bilateral diplomatic relations. Back then, the USSR agreed to transfer the island of Shikotan along with a number of uninhabited islands to Japan after the conclusion of a full-fledged peace treaty, while making it clear that for this condition to come through Tokyo shouldn’t allow any foreign players to build military bases across Japan. However, in 1960, the Japanese government signed the US-Japan Treaty of Mutual Cooperation and Security, which resulted in Washington securing its military presence in Japan. In accordance with this treaty, Washington is obliged to protect the Kuril Islands in the same way as it protects the rest of the territory of Japan. In other words, it allows the United States to deploy its armed forces to those islands whenever it sees fit along with building military bases in any part of the Japanese state, including the Kuril Islands. This agreement resulted in Moscow backing off from its commitment to hand over the islands to Japan, as this step could result in Washington invading the USSR by taking advantage of those islands. Back then, Moscow made it clear that it was willing to hand over the disputed territories to Japan once it signs a peace treaty with the USSR and expels all foreign troops from its territory. However, these days Shinzo Abe would choose to use the topic of disputed islands to strengthen his personal political image in Japan, which was undermined by a series of scandals that arose over the last couple years. 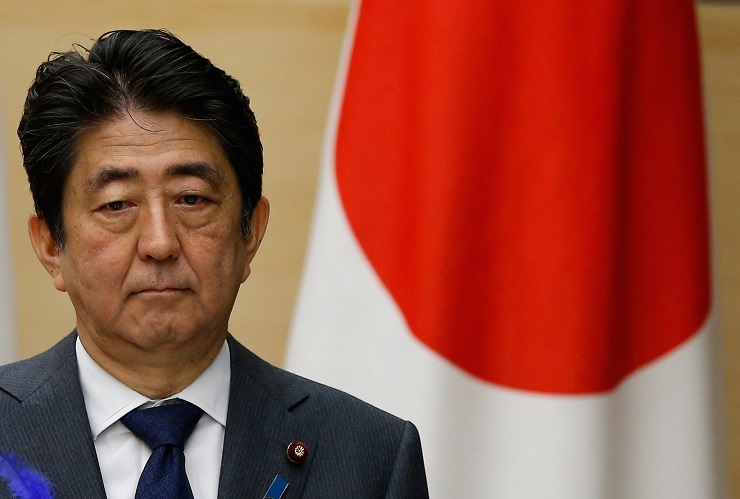 Those made it pretty clear that the situation within the ruling Liberal Democratic Party of Japan is rather complicated which makes the political future of the sitting prime minister rather uncertain. In a bid to score some political points, Shinzo Abe announced that there was some sort of way to persuade Russia into returning the disputed Kuril Islands to Japan. On February 8, 2018, at the first national convention devoted to the return of the northern territories, as those islands are reffered to in Japan, Shinzo Abe officially issued a statement that makes it clear that Japan may try to regain control over its lands through the use of force. A year earlier, Japan’s minister of foreign affairs, Fumio Kishida confirmed to Moscow that there was a chance Washington would install its military bases in the Kuril Islands should Russia return them. However, it’s pretty obvious that this option eliminates the very possibility of Moscow being willing to make this step. At the same time, neither Shinzo Abe nor his administration is willing inform the population of Japan that the transfer of the disputed islands by Russia can be easily achieved through the withdrawal of American servicemen from the country. Thus, he is not just misleading his own population about the alleged possibility of obtaining control over the Kuril Islands without fulfilling the conditions put forward by Russia, but also creates difficulties for the continuation of diplomatic discussions of this issue with Russia. After all, Russia has every right to control Kuril Islands, as those were handed out to Moscow by the US and the UK. Without any doubt, it is a part the territory of the Russian Federation, both de jure and de facto. But the choice of whether it wants American soldiers to stay or whether it wants the Kuril Islands back is for the Japanese people to make, and they have a lot negativity sentiments towards the US over its despicable nuking of Hiroshima and Nagasaki, and thousands of American soldiers deployed across Japan that make their day-to-day lives harder and more uncertain. But without addressing this dilemma, no progress on the issue of the disputed islands can be achieved. It’s like dreaming that out of the blue Washington will choose to hand over Alaska back to Russia.